I've been collecting Breyers for about 10 years now. The first one I received was on the Khemosabi mold of the rose dapple gray Arabian stallion who is very treasured part of my herd. As for Vintage Breyers, I have a few. The main one is a bay Clydesdale who I believe is from the 70s but I'm not fully sure. I have a collector guide but can't really find him in there. His ribbons differ from the pictures shown. So I wonder if he's a variation or something. The photo of the Clyde in the guide is of a "later" model made during those years. It states in the guide: "Later models had cleaner markings." referring to the white on the legs. The model in the photo of the guide has stencil markings, your model appears to have been airbrushed thus the blurry lines on the legs where the bay and white meet. Both models would have been created during the years of 1972-1989 with your model on the earlier side. Do you know what year he was? 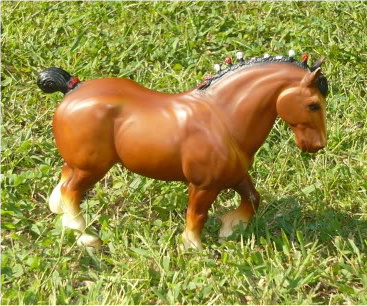 I got him at a flee market for only 10 dollars along with the clydesdale foal Bluebelle, I think that was the foal. And on another note, I'm one of the proud350 people to own Oasis from JAH mag. She's better in person then on a picture, they just don't do her justice! He's the #80 regular version w/the red & white bobs & tail ribbons. There was one w/gold bobs & ribbon too.